Since 1993, Scoopy Doo’s has been providing courteous, professional pet waste removal services in the city of Louisville and the surrounding areas, offering affordable prices and the utmost competent, friendly, and trusted pet poop removal for residential and commercial clients alike. We have grown our business based on dedicated, satisfied customers through personal referrals and our continued commitment to provide services that help in keeping Colorado clean. We proudly offer our pet poo removal services to residential and commercial clients, including HOA’s, where we will gladly remove dog poop from every inch of the property, and ensure that all waste is removed after every single visit. Because we’re confident that you’ll love our services, your satisfaction is 100% guaranteed! Our small team of poop removal specialists knows dogs! We take the time to get to know and understand your pup so that we gain their friendship and trust. Our goal is to make your canine comfortable so that they don’t feel intimidated by our presence when we perform our pet waste removal services. We have experience with dogs of all ages and breeds. Our trusted, reliable dog poop removal services have been offered and provided to satisfied customers in Louisville, Lafayette, Boulder, Longmont, Niwot, and the surrounding areas for over twenty years. We are dedicated to giving the best quality, professional services to each and every client. Your dog’s business is our business! 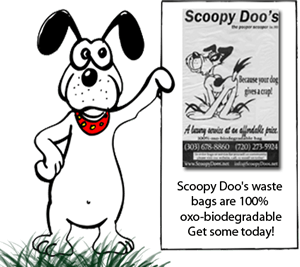 If you have a four-legged friend and need the services of an experienced pooper scooper, take a “load” off and call the friendly, courteous staff at Scoopy Doo’s. Contact us at (303)678-8860, and let us take care of the dirty work!